Calgary’s downtown core is in for a treat as Cactus Restaurants Ltd. opens the doors of its new Stephen Avenue location on Wednesday, November 18, 2015 at 5 pm MST. This stunning space marks the 29th location in 27 years for the award-winning restaurant collection, renowned for its flavour profiles, upscale service and refined design. Executive chef and Iron Chef America champion Rob Feenie leads the talented culinary team to craft a menu that is globally inspired and features fresh, sustainable, and local ingredients. The menu will feature a mix of new flavours alongside classic Rob Feenie Signature Dishes, such as: the tuna stack, Rob’s crispy chicken sandwich, butternut squash ravioli with prawns, and four mushroom sirloin. In addition to the food, sommelier and service director Sebastien Le Goff has crafted a classic cocktail and extensive wine program that includes bold, esoteric, and intricate offerings to highlight Canada’s growing wine industry, old world gems, and new world discoveries. From an interior design perspective, the 6,700 square foot space holds several signature pieces of art, including work by Mr. Brainwash, Andy Warhol, Brent Comber, and Niagara Detroit. The restaurant is lit with an ambient Poul Henningsen (Louis Poulsen) “PH Artichoke Light – Copper” from 1958 and Omer Arbel light installations. The inside space boasts 228 seats with an additional 1,300 square feet and 88 seats on the patio. 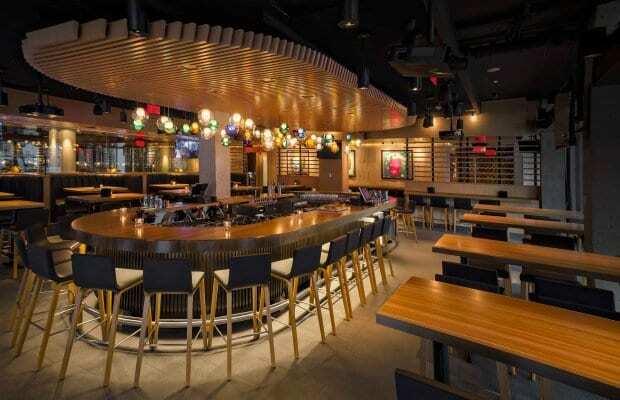 Recognized nationally as one of Canada’s 50 Best Managed Companies and Canada’s Top Employers of Young People, Cactus Club Cafe has hired over 150 employees from Calgary for this new location. Cactus Club Cafe at Stephen Avenue and 3rd Street SW will be open on Wednesday, November 18 at 5 pm MST, and then will open daily from 11 am – 1 am.